Here is my completely biased demonstration comparing modern and traditional snowshoes in deep snow. Very good vid Dave I have 3 pair of MSR Denali's and 3 pair of trads in different sizes and shapes and no matter what trads always win the only time I take the MSR's is when there is lots of steep elevation gain expected and maybe for around camp because you make trails to gather wood etc and the smaller shoe is easier to turn around in "sometimes LOL" I keep them mostly as loner shoes for friends cheers Grizz. Great comparison David. One thing I have done with my GV snowshoes is I cut a piece of plastic from a windshield washer jug and attached it under the crampon. The snow doesn't seem to stick under the crampon anymore. I wouldn't call this a modern vs traditional snowshoe comparison. It would be more accurate to call it a comparison of snowshoes with one pair twice as large as the other. I was surprised that the much larger traditional shaped snowshoe was over 1 pound lighter and still twice as big as the modern one. I also have a 16"x48" pair of the monoline laced huron snowshoes, and I would call those a hybrid snowshoe. As they use a very modern material for the lacing even though the shape is traditional. I also have the modern ratcheting pivoting bind for these snowshoes and with my pack boots, I don't feel the crampon in the least. I wouldn't call this a modern vs traditional snowshoe comparison. It would be more accurate to call it a comparison of snowshoes with one pair twice as large as the other. I consider the monoline shoes to be 'traditional' because they retain the traditional form and function of the original design despite a materials change. Likewise, I define the other shoes as 'modern' shoes based more on form/ function than materials. They are designed for a much different purpose (usually hard packed trails, or hard icy/ wind-swept mountainous areas), and their design reflects that. In much the same way, I consider an HDPE toboggan to be 'traditional' because it retains the same form/ function of the original regardless of materials. I would consider a ski pulk to be 'modern' because it has many design features which change its function (runners better suited to hard/ icy snow, lateral stabilizers for side-hills, etc). Anyways, we're getting into semantics and it really comes down to an opinion of how you want to define things. Of course one pair of shoes was twice as large as the other, which would make the comparison seem unfair, but I think both shoes selected are pretty representative of their two categories. In fact after a quick search on MEC, it appears that 8x30 is nearly the largest modern shoe one can find there. If I really wanted to show a bias I could have grabbed MECs #1 top seller measuring in at 8 x 22"! Of course, I know that 'modern' shoes are available elsewhere in much larger sizes, but as stated in the video they start to become quite heavy. As Grizz pointed out the modern shoes can be fine around camp, and we don't discourage them as a camp shoe (though I much prefer Bear Paw shoes around camp myself), and there are frequently snow conditions where a small shoe is all that's needed even for travel during the day, but we can never know 100% what's coming in terms of weather, and I'd rather be caught out with too much shoe than too little. I was quite harsh on the crampons - they're not always terrible, and there are ways to improve them further (as RR suggests), but there are definitely certain conditions when they have been very detrimental for us: the slush just barely under the surface of the snow float as mentioned in the video is one, another example is when trying to travel on a thin crust of ice that forms after a major thaw and refreeze. Sometimes we travel on only 1/2" of ice overlaying 2-3" of water and the main ice formation - the shoes without crampons do fine, whereas the crampons will break through into the water below. Good comparison. I will stick with my traditionals. Since I bought a pair of Northern Lites shoes last yr all my traditional shoes collect dust now. First off I am doing cross country travel for forestry and biological survey work, so I'm not traveling down lakes and established (open, not brushy) trails. The NL shoes are lighter than traditional shoes and the binding system allows for better control when going through brushy, boggy, untrammeled woods. I purchased the NL shoes reluctantly and talked to the owner to make sure I could return them if I wasn't impressed. When I got them I tried several pairs out in the same kind of terrain around home and the NLs beat out trad shoes in all situations. I wasn't eager to embrace the NLs since my dad builds beautiful trad shoes and it broke his heart that I swung over to the dark side. His largest shoe (6 ft Merrit design) was more work in deep snow due to the large size which was hard to maneuver in the brushy woods or grassy meadows. His wider Ojibwe were too wide and tough to move through brush too. I like the crampon for jumping over blowdowns or from tree to tree in balsam blowdown areas. I also use a modern boot, not soft soled boots. I agree that there are a lot of small modern shoes that are not good for much other than packed trails and even there they don't shine, but the NL shoe is so tough and light and that weight adds up when beating the bush for 6-8 hrs / day and doing that day after day. I wish NL would build a bigger shape than the largest size they have now (the Tundra model I think? ); the owner is considering that. If you ever get a chance to check them out do so. I grew up on traditionals but the moderns make more sense where I camp. I cross a lot of dense bush, over blow downs, through tangles in marshes, etc, where traditionals are too big to back up and change course easily. And the reeds and twigs which poke up through the snow get caught in the webbing of traditional shoes. As for the crampons, they are great for the steep hills, climbing over blowdowns, etc. It's certainly true that the traditionals offer more flotation and hence are better for "traditional snowshoes routes", but one must keep in mind that the 'traditional route' is a type of route determined by the TYPE of snowshoes available then. If you have snowshoes that are great over big open spaces with deep snow, then of course you're going to choose routes that involve big lake crossings or along rivers, etc. But where I camp, it's hilly, densely wooded and traditionals just slow you down or force you to take routes around obstacles, sticking to flat open areas, instead of just taking the shortcuts. As for the bindings, when you're crossing through the sort of terrain I do and you need to back up without getting tangled, have to hop up onto logs and down again, walk across the side of a hill, etc, you need a binding with no 'play'. Laced binding just result in your foot coming out of the binding or else the shoe pivoting under your foot, making you unsteady and unbalanced. I'm glad you qualified your comparison at the end with "our type of trip", but I agree with those who think the video would have been better titled something else than "Moderns vs Traditional Snowshoes". In any case, the video's a very good illustration of why one should use traditionals for your style of camping over the sort of terrain you encounter most. No one has ever been heard to say on a deathbed, "I wish I'd put in more time at the office." For my trips i sometimes take both styles. 16X48 traditional and much smaller moderns. Usually the crampons haven't bothered me over the last long time but was recently finding them to be a bit uncomfortable on my last trip Not sure if its because iam getting older. I have at times found them to really collect snow slush. Especially on smaller deep snow (heavily insulated lakes) like i encountered. I still prefer the smaller moderns around camp or when conditions are good. Maybe one day ill get a smaller set of traditionals as well. Thats a good suggestion RR on the plastic. Here are a few pics showing how the traditionals float on a deep snow/slush and the other showing some choice boot postholes while icefishing. i love those tobaggans your using. It's certainly true that the traditionals offer more flotation and hence are better for "traditional snowshoes routes", but one must keep in mind that the 'traditional route' is a type of route determined by the TYPE of snowshoes available then. Hmm, I don't agree with this at all. I believe the traditional routes were not determined by snowshoe styles available, but rather because they are the most practical means by which to travel long distances with heavy loads. It may be possible to travel through thick brush and densely wooded areas with a light overnight load, but for extended trips with a large toboggan the open areas are a better choice regardless of what's on your feet. In fact, I find it extremely hard to believe that native craftsmen would make a random snowshoe style and then go out looking for terrain in which those snowshoes work. Surely they looked first to the terrain in which they traveled and then designed their snowshoes to fit the terrain?? I think evidence of this would be the huge variety in traditional snowshoe styles across the land, from the long, narrow Ojibwe or Alaskan styles (open areas) to the short, wide Bear Paws, Montagnais or Beavertail styles (dense woods). I cross a lot of dense bush, over blow downs, through tangles in marshes, etc, where traditionals are too big to back up and change course easily. Finally, how do crampons help over downed trees? Unless they are 6' wide west-coast cedars, and you're using the crampons to scale over the side of them?? Anyways, I'm glad we're getting a lively discussion going (even if it seems I'm not listening to the modern arguments, I do appreciate hearing other's perceptions and opinions). I feel there is way too much bad press and misconceptions around the traditional snowshoe styles, and I enjoy trying to get a different point of view out. Thanks fisherman for supplying the slush photos and post holing - great example, hopefully its clear how a crampon could be a detriment in those conditions. Native people have always used our lakes and rivers as travel routes due to it being the path of least resistance. As we all know traveling through thick bush or over high hills really slow one down on traveling. This was mostly done for hunting. When ice fishing I always use my â€œ Traditonalâ€ as they give me more floatation in the slush. In this pic we can see how my dog on the right and the person who traveled before me post holed. Although I was sinking a bit the water came after I had already passed the spot. I hunt a bunch of farms down here in Central Ont. I use my â€œmodernâ€ GV snowshoes. I do sink a lot more but the convienance of stepping over logs and through the thick brush really helps. I do find myself taking the path of least resistance. On my last trip into the farm I had my GVâ€™s and was sinking more than I thought I should even up to my thigh. The next morning I wore my Traditional Trapper style and hardly sunk at all. These are my Modified Bear Paws. Since they are flat I find I am always catching the toe and tripping. They had pretty good flotation though. It is funny. I went for a hike with some Bruce Trail Club members and they insitsted you had and used â€œModernâ€ metal snowshoes. Hope I didnâ€™t get off topic too much. Another thing that works to keep metal parts from icing up is to cover them with clear packing tape. 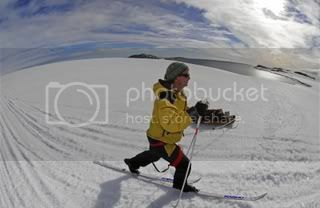 To me, with snowshoes, it is all about size. Size matters. I see no reason why a big snowshoe in a traditional style could not be made with modern materials (e.g. aluminum and monoline) so I think the argument over traditional vs modern is somewhat misleading. I have a pair of 16 x 48, ash frame and monoline, with a modern binding with a crampon, and I just love them. I almost always use them in preference to my Tubbs. The smaller shoes are better for following trails, but often in those situations you don't need snowshoes at all. Both are designed for different conditions and purpose in mind. In northern Minnesota, I use traditional snowshoes entirely. I like traditional shoes for their function, good floatation, and beauty. They work well in the environment I use them in. The only time my traditional have failed is pulling a load up hills on packed trail or hard snow. I can't get enough traction, they slip easily under these conditions. But usually under these conditions I can just take them off and pull without them so they really haven't failed in the strict sense. I don't like taking 2 different pair along because I have enough stuff without doubling up the shoes. Same is true for taking skis and snowshoes. Unless I plan to ski on day trips, I will always go with traditional snowshoes only because they work most of the time under most of the conditions. I have 3 pair of wooden/rawhide shoes. Michigan (13x48), Alaskan, a pair of modified bear paw (10 x 36). The Michigan and the mod bear paw are the most versatile. The mod bear paws, like modern shoes, are the easiest to walk in and for late winter conditions work very well. I like traditional gear but the modern shoes certainly have their place, usually it's behind someone wearing traditional shoes I have seen modern (by modern I mean metal framed with cleats) shoes work very well but their versatility is limited. Out west in the mountains on hard pack, they probably would excel. A few years ago I bought a pair of metal cleated Tubbs for my wife. They were "womens style" which should have been my first clue. I fell for fashion over function, and even though I had the largest size available, they really failed us even in minimal snow depths. Needless to say, I sold them to someone more fashion minded than I and now my wife gets the modified bear paws every time. I think it is a matter of looking at snowshoes as a 'tool'. It is a matter of using the right tool for the job. 'Traditionals' have their place such as in open flatter areas. 'Moderns' have their place such as on steep slopes. Match the snowshoe to the terrain you will be on for that days outing. Use what works for YOU. I have seen smaller 'traditional' snowshoes shaped like 'modern' ones used in the Balkans 1000 years ago. In North America we tend to see things as to what the Indians and Innu used rather than what was/is used in snowy areas of Europe. Thanks Dave for that video. Well done! I think the most telling point was the re-walk on the already packed float from the bear paws, seeing the synthetics sink down again "re-breaking trail" as you say. Its also a fair criticism that the test was somewhat apples-oranges in that there was an obvious size difference. But again as you say that is what the sales-people push and I always shake my head when I see the store racks of modern snowshoes, almost all of which are too small for anything non-packed. I do use my modern synthetics in the wet. In fact I just got back from the mother of all meltdown trips, where over 5 days I saw a lake with deep snow turn to flooded conditions, and the bush lost 1 foot of snow over 3 days. Rain, and soggy snow, etc. So I was very glad to have the ugly synthetics. My babiche snowshoes would have been a stretched out mess. But I was thinking that I need to get me a pair of those mono-line bear paws for the wet conditions. With enough varnish on the wood, I would much prefer those in the wet over the synthetics, as in the terrain I was in, I had no need for crampons. There is the technique of shoving ones toe down into the opening for grip on hills. When there is no crust and its soggy, then the friction of the shoe itself is all that is needed. In steep terrain with icy crusty conditions, there is no arguing that the crampons are needed. I have hiked across the rugged Slate Islands in Lake Superior in mid March in total hard ice crust on the snow, and it was crampons that allowed us to do our work there going up and down the icy rock and literally climbing over mounds of blowdown (caribou habitat surveys). And yet when we hiked back to camp on the ice of the bays, the crampons hurt my feet and I had to take them off and boot it because the snow was too shallow on the ice. 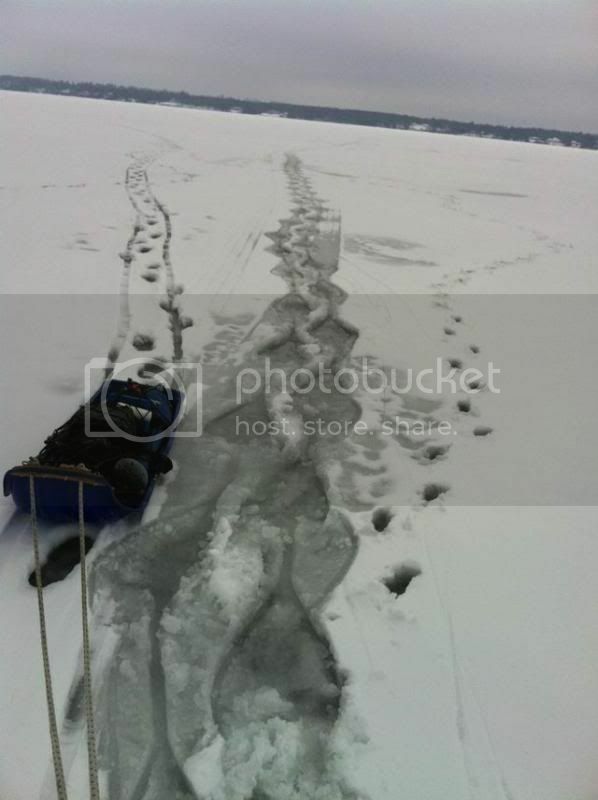 On the soft snow on lake ice slush, there is no contest â€“ the big wide traditionals without a crampon is what is needed to scoot across the "jello" without punching through and flash freezing up a sled. There are so many snow conditions on land and lakes, flats and mountains, that it makes for a never ending discussion! I like and use both, but man I need to get me some mono lines!